Asheville Named "Beer City USA"
More than 19,000 votes and hundreds of heated comments and blog posts marked a neck-n-neck tie-breaker for the title of "BeerCity USA 2010" in an online poll celebrating American Craft Beer Week. In the end, passion for the small, but mighty, brewing culture of Asheville, North Carolina surpassed brewing giant Portland, Oregon. Last year, the East Coast vs. West Coast battle ended in a tie between the two cities. "Beers experienced from breweries in both cities, I can attest to, are worth the journey to these American beer Meccas. In fact beer enjoyed in most American cities is worth the journey. Beer drinkers are on notice: You can leave home now-better beer awaits," said Examiner.com poll host and founder of the Association of Brewers Charlie Papazian. Known for its scenic beauty, music culture and robust art scene, Asheville&apos;s reputation as a haven for brewing and culinary arts is growing. With a population of just over 70,000, Asheville is giving bigger cities a beer-run for their money with nine diverse craft breweries-more per capita than any city in the nation. 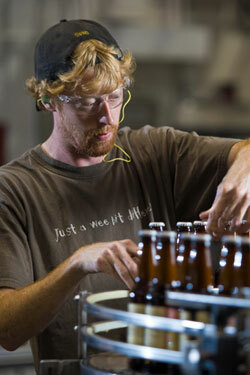 On any given day, about 50 local beers can be enjoyed on draft and in bottles. Asheville is home to a world-renowned specialty beer store (Bruisin&apos; Ales, rated #3 retailer worldwide by RateBeer), five annual beer festivals, a regular "Beer Guy" column in the local paper, and a growing array of local beer-flavored food products. (Highland Black Mocha Stout ice cream, anyone?) Asheville Brews Cruise offers an insider&apos;s look at Asheville&apos;s rapidly evolving microbrewery scene complete with designated driver.